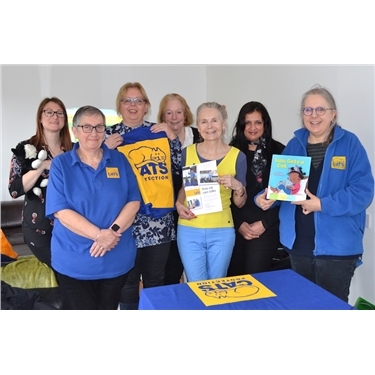 Cats Protection ‘talk’ volunteers met up with Kelly Matthews, Community Education Officer – Wales and Central England, at the Birmingham Adoption Centre to ‘talk about talks’ on Saturday 16 March. After a warm welcome and introductions all round, Kelly explained that Education now came under the Vet Department of NCC, with Maggie Roberts at the helm. Experienced speakers and new recruits alike enjoyed the various power-point presentations and animations – with a few tears shed when the Kozal Christmas clip was shown. This was the sad but true story of the last cat left behind at the National Adoption Centre before finally finding a loving home – albeit just after Christmas 2017. Pictured is the line-up of Cats Protection volunteers who went along to the training and get-together session at the Birmingham Adoption Centre in March: (l to r) Kelly Matthews, Debbie Sherwood, Esther Riches, Pam Wood, Sheila Pennell, Surjit Jakhu and Jane Holt. Richard Brown of North Birmingham branch attended too, but was behind the camera! After the refresher training, everyone was treated to a tour of the Adoption Centre, and met dozens of moggies – old and young, Mums and kittens – all waiting for viewers and the chance of a new forever home. Says Kelly: “Cat care talks are free, and we offer curriculum-linked workshops to schools and talks to community groups. It’s a chance for adults and children to learn about cat behaviour and responsible pet ownership. A very important part of our work at Cats Protection is to help people understand cats and how to look after them.